This Pincemaille family of Eclaron, 52 Haute Marne lived near the "Lac du Der-Chantecoq" on the borderline of the departments of the "Marne" and the "Haute Marne". This fPincemaille amily was not involved in the wine business as in the nearby Thonnance-lès-Joinville. The first known was Gilles Pincemaille x Suzanne de la Ferté father of Louis Pincemaille (1616 -1682) who married 12th jan 1644 in Eclaron with Anthoinette Jacquot. - Nicolas #3691 (1727-1763), grandson of Jean #10594 and son of Louis (1693 - ) was a smith (F: maréchal ferrant, Nl: smid, hoefsmid). - 2 sons of Nicolas #3691, came as volonteers in 1792 in the army of the French revolution. .
- - Léandre Pincemaille , at the evening of 6h june 1800, Napoleon explained his "plan de campagne" to his officers. The sublieutenant, Léandre Pincemaille (officier payeur de la 12° Hussards), his collegue Galy de Montagla and the lieutenant Loquette made a last "escapade" in Milan, but leaved the same night, under the rain,at one o'clock Milan for the final battle at Marengo, four days later. This battle will be decisive for the career of the futur emperor Napoleon Bonaparte. In memory of this victory his horse will be named Marengo. "Le sous-lieutenant Galy Montaglas arrive le 6 juin 1800 à Milan, qq jours avant la bataille de Marengo contre les Autrichiens (14 juin 1800). Ce soir du 6 juin Napoléon ressemble ses officiers autour de lui et leur explique son plan de campagne: la troupe devra se mettre en route à une heure dans la nuit à fin de donner un 2° coup aux Autrichiens. Puis Galay Montaglas part avec son collègue le lieutenant Loquette en ville (Milan) ou il rencontre Pincemaille, officier-payeur au 12° Hussards. Un page (guide) leur guide chez les filles, puis ils dînent, puis passent encore une fois chez les filles. Il décrit en détail ce qui se passe. A cause du contexte pornographique cette partie n'est pas reprise dans cette publication. Ils retournent vers minuit dormir dans la caserne, mais dans la nuit à une heure du matin la troupe doit se mettre, sous la pluie, en route pour Pavie à 21 miles de Milan." "La bataille de Marengo, une semaine plustard, était décisive pour la carrière de Napoléon, qui atteignait une telle popularité qu'il pouvait prendre tout le pouvoir en France. Il va nommer d'ailleurs son cheval Marengo." - - Jean-Baptiste Pincemaille-Duclozet #10257(1770-1853) was an army volunteer in 1792 and became lieutenant in 1793. He was involved in the campaigns of 1793, 1794 and 1795 of the army of the "pyrénées occidentales" and became captain in 1803. 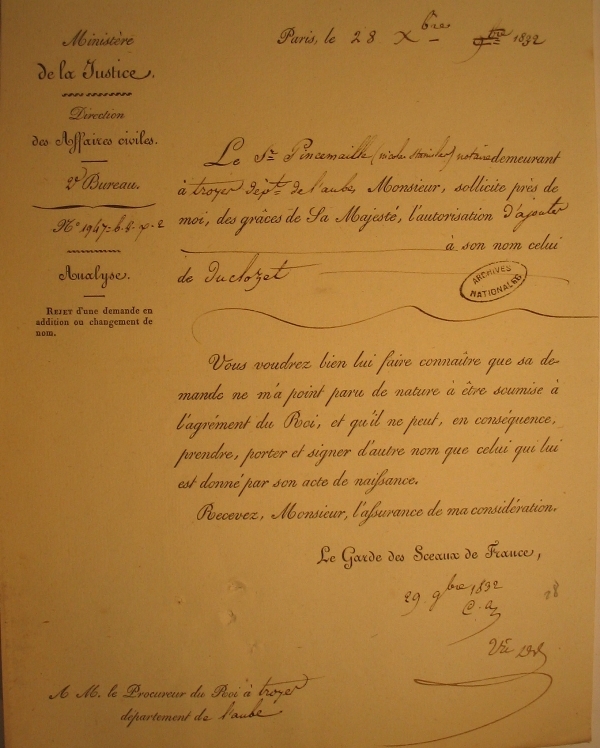 - - - Nicolas-Stanislas Pincemaille-Duclozet #6300 (1803, St Diziers - 1857, Paris) son of th above mentionned Jean Baptist Pincemaille-Duclozet #10257 became a notary in 1832. Nicolas-Stanislas was as well as his father a son of a first mariage. To make the difference with the children of the second mariage of their fathers, they attached Duclozet at their surname (patronyme). Unknown is the reason why they choosed for Duclozet. He studied for lawyer in Paris. We know him as a man of 1m 60 with brownish hair and bleuisch eyes from his passport of 1829 in Paris after he finished his studies. 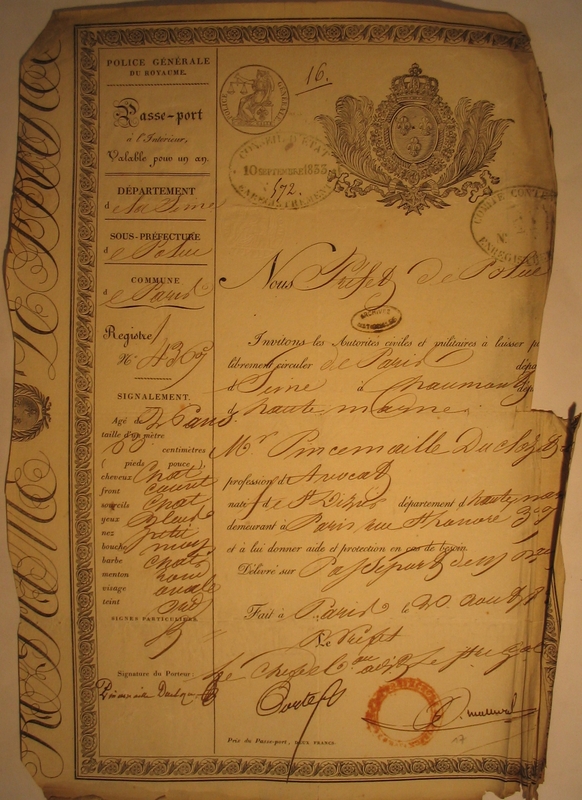 Nicolas-Stanislas became in 1832 notary in Troyes, 10 Aube, Cham, Fra. Then he tried all the possible to officialize his patronyme Pincemaille-Duclozet, but he was not successfull. The minister of Justice gived a negative decision the 29th of Nov 1832 and his administration posted this decision the 28th ( Feast of the Holy Innocents children ..) of December 1832. Nevertheless this was not the end of the procedure because finally the name change was accepted and published in the "Bulletin des Lois" of the 22th nov. 1833. His son Henry will die in 1857 in Paris, a month before he died in Paris. No further descendants Pincemaille are known. -We found in some periods a very high percentage of children dying at a young age. We are developping this genealogy. So verify the data. All informations and remarks are very wellcome.